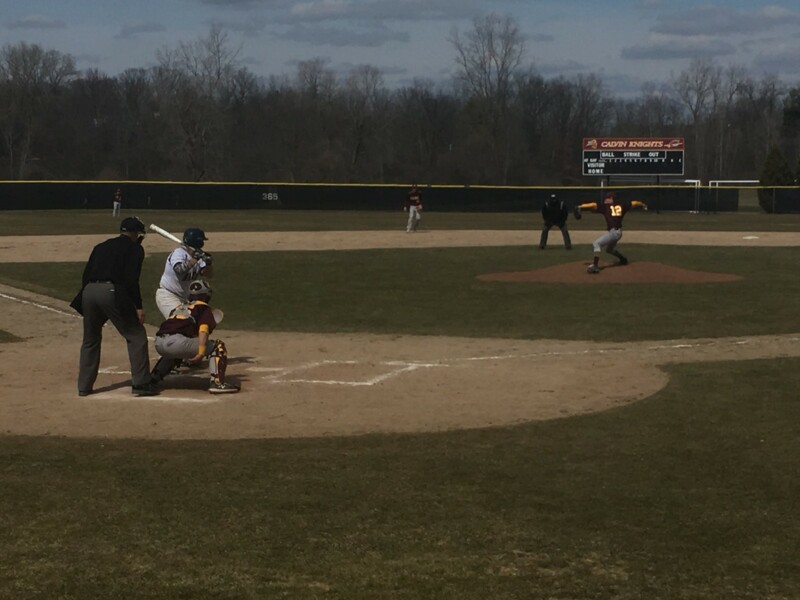 GRAND RAPIDS – The Grand Rapids Community College Baseball team picked up its eighth and ninth straight wins Tuesday with a sweep of the Calvin College Knights, 17-2 and 8-1, at Knights Field in Grand Rapids. Tuesday’s doubleheader sweep was just the third set of games the Raiders had played since dominating their Michigan Community College Athletic Association rival Ancilla College Chargers on March 29, then again on Sunday. For Head Coach Mike Cupples and his squad, the sweep came at a perfect time following a week riddled with weather delays. The first game on Tuesday started off well for the Knights as they converted a pair of hits into two runs off of Raiders left-handed pitcher Nolan Hamilton. The Raiders would later tie the game in the top-half of the second inning on a throwing error from the Knights’ outfield and freshman infielder Brady Paganelli crossed the plate to cut the Knight lead in half. In the third inning, the Raiders tied the score when freshman designated hitter Alec Lockwood hit a hanging curveball off the scoreboard in centerfield for a two-run homerun that plated freshman infielder Isaac Raab. That round-tripper would give the Raiders the lead for good. The Raider half of the fourth inning broke the game wide open. The offense knocked around five hits in six at-bats scoring eight runs, with a pair of singles sophomore outfielder Dylan Limbacher and Lockwood. To go along with three doubles freshman outfielder John Huistra, sophomore catcher Cam Brayman and freshman outfielder Calvin Syrjala. Lockwood was the star of the offense going 2-3 from the plate with a single, home run and three runs batted in. Hamilton was credited with the victory in the first game after striking out fivefive batters giving up two runs on six hits in four innings of work. Left-handed sophomore Joe Stranz picked up his second save of the season after allowing just three hits and striking out six batters in three innings of relief. The second game of the doubleheader began much like the first – low scoring. Freshman left-handed pitcher Josh Greiffendorf dominated the Calvin lineup, allowing just three hits and striking out four batters in five innings of work, he also picked up his first win of the season (1-0). The Raiders committed only three errors in the doubleheader, which is music to Cupples’ ears. Paganelli hit his second home run of the season to right-center field, which was a two-run shot to help add to a five run, three hit third inning for the Raiders. The extra-base-hits came in succession as Lockwood hit a double to right, Syrjala hit a double to left, which scored Lockwood, then Paganelli’s homer to push the Raider lead to 6-0. Cupples was happy with the fact that all of his players had the opportunity to play out of conference before the stretch of conference games to close out the month of April saying that Tuesday’s doubleheader was, “huge,” going forward. The Knights added a run in the bottom of the seventh inning, and thought they had a second run but a fly-ball that was missed by Syrjala rolled over the line and out of play. Knights Field does not have walls that extend from the dugout to the outfield wall, but the lines of play are drawn into the grass with turf paint. Following the dominating pair of sweeps, the Raiders look to continue to take care of business as they travel to Benton Harbor on Friday to take on the Lake Michigan College Redhawks for a doubleheader with first pitch scheduled for 2 p.m.